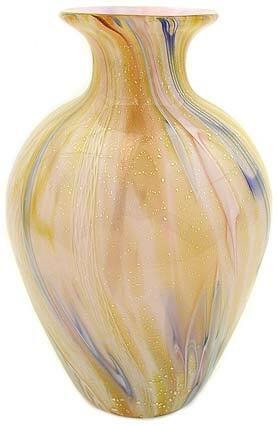 Blown Murano glass vase in a mixture of colors reminiscent of the painted deserts of the Southwest. Another fine example of the difficult incaminciata technique. 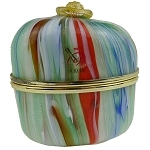 This technique is characterized by its thin, double layers of glass, obtained by successively collecting layers of different colors out of the furnace's pot. Approximately 10 1/2 inches in height and 6 1/2 inches largest diameter. Size may vary somewhat due the the uniqueness of handmade Murano glass.